Gluten-Free Living > Recipes > Gluten-free Dessert Recipes & Gluten-free Sweets > Oh! Christmas Trees! Don’t let the holidays get overrun by your to-do list. 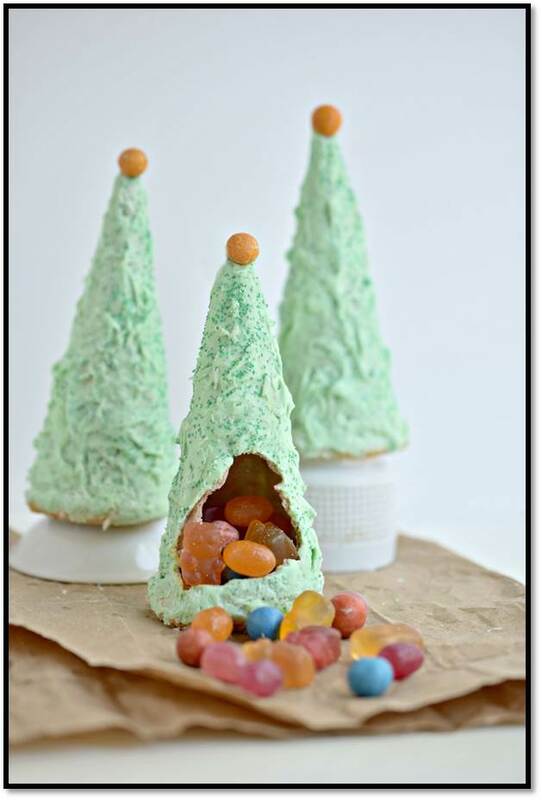 Set aside time to make these cute Christmas tree piñatas for your children or with them. You can assemble the piñatas beforehand and watch with sheer delight as the kids open their cones to find a secret stash of candy and treats. Or let the children be a part of the building, decorating and filling. The end result might not be as perfect as if you did it yourself, but the fun you’ll have creating this seasonal, edible craft together matters more. Stir food coloring into the melted white chocolate until evenly mixed. Gently coat each cone with the green white chocolate using the back of a spoon. Make sure the cone is completely covered, being careful not to break it. Dust with green sprinkles or sugar crystals, if desired, to add more color to the trees. Top with a round candy. Place on a baking sheet with parchment paper and freeze until set. Spread the remainder of the white chocolate around the edge of the cookies. 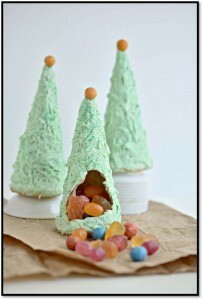 Fill the cones with gluten-free candy or treats and place the cookie on top to secure. Flip the cone so the cookie is on the bottom of the tree and allow to set. Break open and have fun eating! Nutrition Analysis: 280 cal, 13 g fat, 20 mg chol, 90 mg sodium, 39 g carbs, 1 g fiber, 26 g sugar, 3 g protein. Cara Reed is the creator of Fork & Beans, forkandbeans.com, where she shows people with food allergies that food can still be fun, creative and tasty. She is also the author of the cookbook Decadent Gluten-Free Vegan Baking.